Yesterday I noticed the African Iris (Dietes vegeta) in my back garden was awash with buds. I'm really fond of the look of the plants with buds signaling a most certain burst of blooms to come at the next sunrise. That's how it goes with these wonderful maintenance free perennials. We got a fairly nice rain through out the night last night. When the dawn came it wasn't sunny but still very overcast. Looking out my kitchen window I have a clear view of several spots of African Iris planted in strategic places. They are easily transplanted by digging up any part of the existing plant- just be sure to include the roots. I even put them in containers to add height and interest. Mention the flower iris, and the first one that comes to mind is the bearded iris- but not in Central Florida. Bearded iris doesn’t bloom here due to the heat. You could even think of African Iris as more like a grass than an iris. In my view, it offers an incredibly wonderful vertical texture for the landscape with its spreading fans of stiff, leathery sword-shaped evergreen leaves. You could even say it is graceful in appearance. 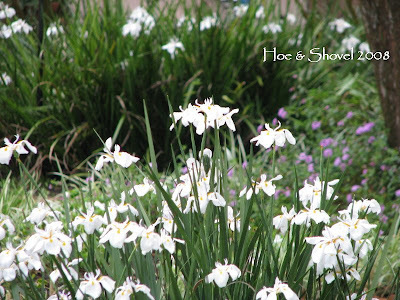 It’s a mainstay perennial at Hoe and Shovel that spreads on creeping rhizomes. Its flowering stalks rise above the greenery to bloom in a succession of short-lived blossoms throughout the year. Mine slow down towards the end of summer and start their on-again, off-again show in December anytime we get a good soaking rain and cooler temps. They are drought tolerant but do especially well in full sun and moist soil. The flowers, rather flattened and nearly 3” across, are milky white with yellow & purple markings. Just gorgeous. Seeing all of your blooms makes me anxious to have more blooming in our garden. we're so far from spring here..these help clear the gloom. Happy Spring Meems!!! Your photos today were exceptionally lovely, I've never seen that African Iris and I'm in love with it now. Wonderful photos, Meems. Those are beautiful specimens of the iris. I love the close up showing the lavender and gold details. Thanks. Those are beautiful irises. I agree, most people think of the old-fashioned "flags" or bearded iris as the only irises, but there are a lot of other species. I'm enjoying my little early spring blooming irises that are only six inches tall and blooming. Those are SO pretty, Meems! Those african Irises are lovely! Do you know if they can be grown in colder zones than yours? Your photos are lovely, I have a soft spot for iris. Thank you to everyone who commented and enjoyed the spring blooms of African Iris. 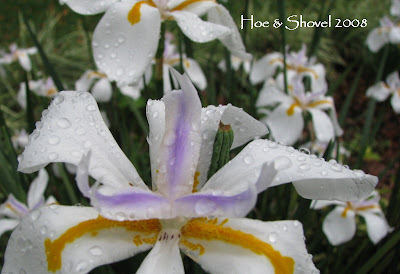 Connie & Dee- Just to be sure I did some research and African Iris is hardy in Zone 8-10. It could be killed in severe winters upwards of Zone 8. I hope you each have a wonderful and blessed Easter! Meems, I read your post with deep interest. I got some seeds of African Iris when I was in California in october, visiting my son, and they have sprouted and are now around 12 centimeters high. They won't survive here, I know, but I intend to keep them in pots in our wintr garden. 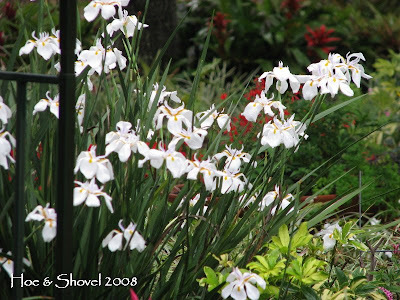 (I've got only one sprouted seed of the beautiful variety on your pictures, the others are dietes bicolor). I tend to scatter my plants around here and there, but there is so much more of an impact when they are planted in larger quantities. Happy Easter Meems... sorry I've not been around much recently - no time for blogging and so much I'd like to post... hopefully might get some more time this week! Love the Irises - we've got similar ones here - but they're not out yet! Oh, I have no idea why I hadn't found your blog before. I think we have a very similar climate. Mine might be a tad hotter but this is so exciting. I am busy reading your past posts to see what I can do down here in my garden. Katarina: Most interesting.Can't wait to hear how your iris does from seed. All the best to you as you nuture it to bloom. Robin: so much of the fun of gardening is in the design - don't you think? Design is where I get so much thrill. I like to plant certain plants in larger quantities in more than one place for even more impact. Miranda: You are a busy girl.I find it hard to keep up sometimes with gardening AND blogging. Just as long as we don't lose you all together. We miss you and look forward to your next post. Happy Easter to you and happy gardening. Theresa: Took a peek at your blog- I'm pretty sure Mexico is more tropical than we are here. But I don't doubt that we certainly have lots of similar capabilities. Thanks for stopping by. Beautiful picutres! I used to live in Ft. Lauderdale...but it was before I was a gardener, so I missed out on all of those cool tropicals! Hi Meems...I was enjoying your title picture and just had to ask what the pale green plant is that is located to the right of the burguny colored leaf plant? The color combination of this bed is striking - just beautiful. You really have an eye for color. Miranda: Glad to know you are going to stay around.You make a wonderful contribution to the garden blogging world. jean ann: Ooooo Ft.Lauderdale is VERY tropical - where Ficus trees line the streets like so many green leafy beauties and never freeze. Thanks for visiting Hoe&Shovel. Susan: Thanks. 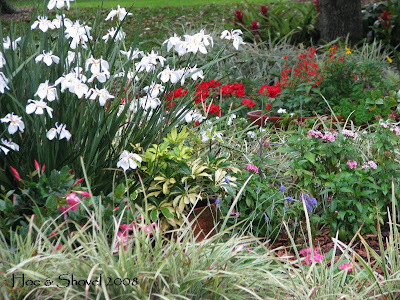 In Florida a mixture of colored foliage and flower is the key to interest isn't it? I think you may be asking me about the border plants seen in the background behind the blood leaf? Not sure but if so, those are variegated liriope.They are almost the standard in my back gardens for finishing off every bed. Since I am quite certain you could ID those with your eyes closed I'm wondering still if I've answered your question. There is a pop of Jewel of Opar to the right and also there is a chartruese (sp?) green potato vine in the background. 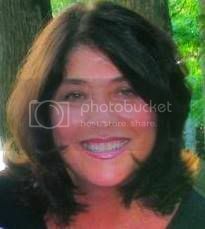 Let me know if I haven't spotted what you are inquiring about and we can give it another go. 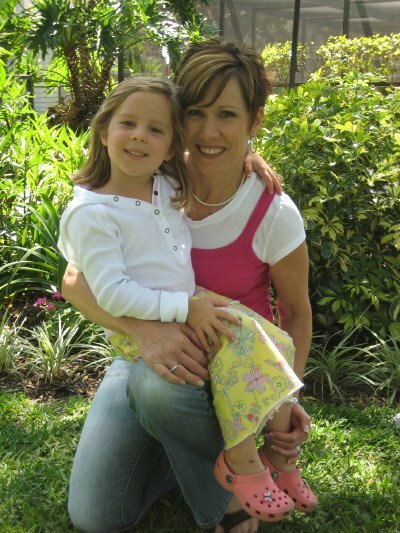 Thanks for always being the voice of encouragement.Florida gardening is unique :-) and I know you know that so it's nice to hear it from you! Your gardens are lovely and lush. The iris are beautiful. I don't mind a few bearded iris, but (in my experience) if they're not afforded a wind break, their tall flower stalks topple in a wind. Gorgeous flowers! I sure wish it were warm enough here to see flowers. I guess I'll just have to satisfy myself by looking at everyone else's pictures for now! Shady Gardener: I've no experience with the bearded but this particular variety is extremely strong which is another plus. Cinj:Getting to look at everyone elses flowers is so much fun but here's to warmer weather for you so you can see your own. Thanks for visiting Hoe & Shovel. I just love your photos! Great post. Your garden is beautiful! Marie: Thanks for the kind words.